“Monk, this person has six elements, six sense-domains, eighteen mental explorations, and four resolutions. Standing where one is not flooded by the flow of notions, one is called a ‘peaceful sage.’ One does not neglect wisdom, one protects truth, one practices renunciation, and one trains for peace. This is the summary of the analysis of elements. “‘Monk, this person has six elements’ – that is what was said. What does it refer to? The earth-element, the water-element, the heat-element, the wind-element, the space-element, and the consciousness-element. ‘Monk, this person has six elements’ – that is what was said, and this is what it refers to. “‘Monk, this person has six sense-domains’ – that is what was said. What does it refer to? The domain of eye-contact, the domain of ear-contact, the domain of nose-contact, the domain of tongue-contact, the domain of body-contact, and the domain of mind-contact. ‘Monk, this person has six sense-domains’ – that is what was said, and this is what it refers to. “‘Monk, this person has eighteen mental explorations’ – that is what was said. What does it refer to? After seeing a sight with the eye, one explores a sight that is a basis for elation, one explores a sight that is a basis for depression, and one explores a sight that is a basis for equanimity. After hearing a sound with the ear… odor with the nose… flavor with the tongue… tangible object with the body… mental object with the mind, one explores a mental object that is a basis for elation, one explores a mental object that is a basis for depression, and one explores a mental object that is a basis for equanimity. In this way, there are six explorations of elation, six explorations of depression, and six explorations of equanimity. ‘Monk, this person has eighteen mental explorations’ – that is what was said, and this is what it refers to. “‘Monk, this person has four resolutions’ – that is what was said. What does it refer to? The resolution of wisdom, the resolution of truth, the resolution of renunciation, and the resolution of peace. ‘Monk, this person has four resolutions’ – that is what was said, and this is what it refers to. “‘One does not neglect wisdom, one protects truth, one practices renunciation, and one trains for peace’ – that is what was said. What does it refer to? “Monk, how does one not neglect wisdom? Monk, these are the six elements: the earth-element, the water-element, the heat-element, the wind-element, the space-element, and the consciousness-element. “Monk, what is the earth-element? The earth-element can be internal and it can be external. Monk, what is the internal earth-element? Any internal component that is firm, solid, and an object of attachment – such as head-hair, body-hair, nails, teeth, skin, muscles, tendons, bone, bone-marrow, kidneys, heart, liver, membranes, spleen, lungs, bowels, intestines, stomach, and excrement – or any other internal component firm, solid, and an object of attachment: monk, this is called the internal earth-element. The internal earth-element and the external earth-element are exactly the same earth-element. It is to be seen accurately with correct wisdom in this way: ‘That is not mine, that is not me, that is not my self.’ Seeing it accurately with correct wisdom in this way, one becomes disenchanted with the earth-element, and the mind becomes dispassionate regarding the earth-element. “Monk, what is the water-element? The water-element can be internal and it can be external. Monk, what is the internal water-element? Any internal component that is liquid, fluid, and an object of attachment – such as bile, phlegm, pus, blood, sweat, fat, tears, grease, saliva, mucus, oil, and urine – or any other internal component that is liquid, fluid, and an object of attachment: monk, this is called the internal water-element. The internal water-element and the external water-element are exactly the same water-element. It is to be seen accurately with correct wisdom in this way: ‘That is not mine, that is not me, that is not my self.’ Seeing it accurately with correct wisdom in this way, one becomes disenchanted with the water-element, and the mind becomes dispassionate regarding the water-element. “Monk, what is the heat-element? The heat-element can be internal and it can be external. Monk, what is the internal heat-element? Any internal component that is hot, heating, and an object of attachment – that which warms the body, ages the body, destroys1 the body, and digests food and drink – or any other internal component that is hot, heating, and an object of attachment: monk, this is called the internal heat-element. The internal heat-element and the external heat-element are exactly the same heat-element. It is to be seen accurately with correct wisdom in this way: ‘That is not mine, that is not me, that is not my self.’ Seeing it accurately with correct wisdom in this way, one becomes disenchanted with the heat-element, and the mind becomes dispassionate regarding the heat-element. “Monk, what is the wind-element? The wind-element can be internal and it can be external. Monk, what is the internal wind-element? Any internal component that is wind, windy, and an object of attachment – winds going up, winds going down, winds in the stomach, winds in the abdomen, winds in the limbs, inhalation, and exhalation – or any other internal component that is wind, windy, and an object of attachment: monk, this is called the internal wind-element. The internal wind-element and the external wind-element are exactly the same wind-element. It is to be seen accurately with correct wisdom in this way: ‘That is not mine, that is not me, that is not my self.’ Seeing it accurately with correct wisdom in this way, one becomes disenchanted with the wind-element, and the mind becomes dispassionate regarding the wind-element. “Monk, what is the space-element? The space-element can be internal and it can be external. Monk, what is the internal space-element? Any internal component that is space, spacious, and an object of attachment – inside the ears, inside the nose, the mouth, the esophagus, the stomach, the bowels – or any other internal component that is space, spacious, and an object of attachment: monk, this is called the internal space-element. The internal space-element and the external space-element are exactly the same space-element. It is to be seen accurately with correct wisdom in this way: ‘That is not mine, that is not me, that is not my self.’ Seeing it accurately with correct wisdom in this way, one becomes disenchanted with the space-element, and the mind becomes dispassionate regarding the space-element. “Then what remains is consciousness – completely pure and clean. What is cognized by that consciousness? Pleasant is cognized, unpleasant is cognized, neutral2 is cognized. “Then what remains is equanimity – completely pure, completely clean, pliable, workable, and bright. Monks, just as a skilled goldsmith or apprentice goldsmith might prepare and light a forge, then take some gold with tongs and place it in the forge; sometimes he would blow on it, sometimes he would sprinkle water on it, and sometimes he would just observe it. In this way, that gold would become well-smelted, refined, free of impurity, pliable, workable, and bright, and he could produce whatever was needed – an anklet, an earring, a collar, or a golden necklace. In the same way, monk, what remains is equanimity – completely pure, completely clean, pliable, workable, and bright. “One knows, ‘If I direct this completely pure and completely clean equanimity to the dimension of infinite space, I would be able to develop my mind accordingly; based upon and holding to that equanimity, it would remain there for a long time. If I direct this completely pure and completely clean equanimity to the dimension of infinite consciousness, I would be able to develop my mind accordingly; based upon and holding to that equanimity, it would remain there for a long time. If I direct this completely pure and completely clean equanimity to the dimension of nothingness, I would be able to develop my mind accordingly; based upon and holding to that equanimity, it would remain there for a long time. If I direct this completely pure and completely clean equanimity to the dimension of neither perception nor non-perception, I would be able to develop my mind accordingly; based upon and holding to that equanimity, it would remain there for a long time. But that is conditional. “Monk, just as an oil-lamp burns in dependence on oil and wick, and when that oil and wick are completely used up, if there is no other fuel it will go out4; in the same way, monk, if one feels a feeling that ends with the body, one knows ‘I am feeling a feeling that ends with the body.’ If one feels a feeling that ends with life, one knows ‘I am feeling a feeling that ends with life.’ One knows, ‘When there is separation from the body after death, following the completion of this life, all that is felt here will become cool, as there is no obsession with it.’ Therefore, monk, one who has this, has the paramount resolution of wisdom; for this is the paramount noble wisdom: the knowledge of the complete elimination of suffering. “That liberation is unwaveringly based in truth. Monk, that which has a deceptive nature is false, and that which has a non-deceptive nature is true – Nibbāna. Therefore, monk, one who has this, has the paramount resolution of truth; for this is the paramount noble truth: Nibbāna, which has a non-deceptive nature. “Previously one was foolish, and collected acquisitions5. Now one has abandoned them, severed them at the root, eliminated their basis, annihilated them, and made it impossible for them to arise again in the future. Therefore, monk, one who has this, has the paramount resolution of renunciation; for this is the paramount noble renunciation: the relinquishment of all acquisitions. “Previously one was foolish, and had longing, desire, and passion. Now one has abandoned them, severed them at the root, eliminated their basis, annihilated them, and made it impossible for them to arise again in the future. Previously one was foolish, and had anger, aversion, and hatred. Now one has abandoned them, severed them at the root, eliminated their basis, annihilated them, and made it impossible for them to arise again in the future. Previously one was foolish, and had ignorance and delusion. Now one has abandoned them, severed them at the root, eliminated their basis, annihilated them, and made it impossible for them to arise again in the future. Therefore, monk, one who has this, has the paramount resolution of peace; for this is the paramount resolution of peace – the pacification of lust, hate, and delusion. “‘One does not neglect wisdom, one protects truth, one practices renunciation, and one trains for peace’ – that is what was said, and this is what it refers to. “‘Standing where one is not flooded by the flow of notions, one is called a “peaceful sage”’ – that is what was said. What does it refer to? Monk, ‘I am’ is a notion, ‘I am this’ is a notion, ‘I will be’ is a notion, ‘I will not be’ is a notion, ‘I will be with physical form’ is a notion, ‘I will be without physical form’ is a notion, ‘I will be percipient’ is a notion, ‘I will be non-percipient’ is a notion, ‘I will be neither percipient nor non-percipient’ is a notion. Monk, a notion is a disease, a tumor, a piercing sting. Monk, one who transcends all notions is called a ‘peaceful sage.’ Monk, a peaceful sage is not born, does not age, does not die, is not agitated, and does not yearn. Monk, he has nothing which would cause him to be born. When one is not born, how can they age? When one does not age, how can one die? When one does not die, how can one be agitated? When one is not agitated, how can one yearn? Standing where one is not flooded by the flow of notions, one is called a “peaceful sage”’ – that is what was said, and this is what it refers to. Then Venerable Pukkusāti delighted and rejoiced in the Blessed One’s speech. He rose from his seat, paid respects to the Blessed One, and having done what was appropriate he left in search of a bowl and robes. Then while Venerable Pukkusāti was searching for a bowl and robes, a stray cow killed him. 3 Paritassati. This is from the root tas, the same root from which we get the words taṇhā and tasiṇā (both of which mean ‘craving’). 4 Nibbāyati. This is the same root as nibbāna. 5 Upadhi. This term can refer either to acquisition in a mundane sense (such as objects and ideas), or to the acquisition of mental tendencies that keep one bound to saṁsāra. In this context it is the second meaning that is most relevant. 6 Āvuso. 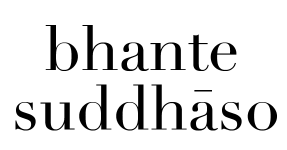 This is a term of address used between equals, and is what monks usually called each other during the time of the Buddha. The more polite term of address is “Bhante,” which is what laypeople would call monks, and what monks would call the Buddha. Accordingly, Ven. Pukkusāti is apologizing for addressing the Buddha as an equal. This distinction is peculiar to the Pāli language; the English term “Venerable” does not carry this connotation and can be used when addressing senior monastics.